Opening hours: Stores are usually open Monday - Saturday 9:00 - 13:30 and 16:30 - 20:00. The large department stores usually stay open a few hours later, especially during the summer months. Monday - Friday 09:00 - 19:30. Saturday - Sunday 10:00 - 14:00. 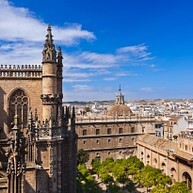 Today’s Seville is a lively place, bustling with culture, music, exquisite food and an unstoppable personality. Some of the city's main sights include the Moorish castle of Alcazar, the former upper-class neighbourhood of Santa Cruz, the promenades along the Guadalquivir River, the rougher Macarena neighbourhood with its Baroque churches, and the oldest bar in Spain, El Rinconcillo. The city’s gigantic Parque de Maria Luisa is worth visiting, as are the bohemian chic bars in the Alameda de Hércules district. This amazing massive building is the most impressive sight along with the cathedral and is a must-see when visiting Seville. 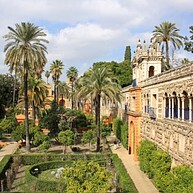 It is located in the stunning Maria Luisa Park and was built for the Ibero-American Exhibition of 1929, held in Seville. The style of this amazing building is inspired by the Renaissance with characteristic elements from the city: exposed brick and ceramics. Fun fact to know if you are a Star Wars fan: Plaza de España has been used for some of the scenes of episode II of George Lucas' Star Wars saga "Attack of the clones". The singing, dancing and flamenco guitar are captivating; you have not experienced the true spirit and soul of Seville if you have not seen a flamenco show. Los Gallos Flamenco Show has been entertaining guests since 1966 and offers outstanding shows with top class artists, making it the most recognized and respected Flamenco show in town. It is easy to mistake this for a Moorish palace, for it was built in the 1360’s by Moorish Muslim kings, with the lush gardens complementing the buildings perfectly. The upper levels of this spectacular palace are still used by the royal family, making it the oldest royal palace still in use in Europe. Stroll around in the heart of Seville and enjoy the charm of the quarter of Santa Cruz, with its winding alleys, its picturesque houses and its small squares. It is located in the old part of the city and is without a doubt the most popular and crowded quarter in Seville. This is also where you can see important tourist attractions like the Cathedral, the Giralda, the Royal Alcázar, the Murillo gardens and the Archivo de Indias. During Easter Week, Seville is transformed into a photographer’s paradise. Processions with the Virgin Mary and Jesus, the Nazarenos asking for penance, and colourful but not necessarily well-tuned orchestras all crowd the streets and fill the city with vibrant life. This is a great way to get an overview of the city sights, while doing something healthy at the same time. There are no strenuous hills and as long as you don’t suffer from any health problems, this is the way to go. This museum, located in a former convent, has several masterpieces in its collections. Works by Goya, Murillo, Millian and Ribera share the space with modern art exhibitions. 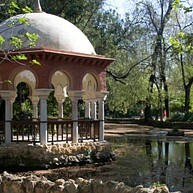 Maria Luisa Park is designed in a mix of 1920's Art Deco and mock Mudejar and is one of the largest parks in Seville. This park is beautifully decorated with plenty of ceramic-tiled benches, fountains, pools, statues and monuments. 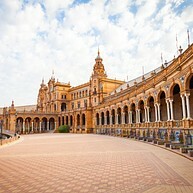 However, travellers often head straight to the star attraction of the park, Plaza de España. 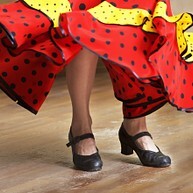 To learn more about the fascinating world of flamenco dancing, head to the Museo del Baile Flamenco. This is a must for all the tourists who would like to experience and understand this amazing bit of Andalusian culture. In this 18th-century building you can stroll around the exhibition hall, the basement and the dance studio. 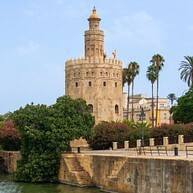 The Torre del Oro, or Golden Tower, is a historic watchtower which was constructed in the early 13th-century by the Almohades, who ruled over Andalusia. The tower was in fact a part of the city's defensive walls. Now it is one of Seville's most photographed landmarks. When visiting the Basílica de la Macarena, you will see one of the dearest treasures of Seville, the statue of la Virgen de la Esperanza (the Virgen of Hope), known as la Macarena, the same name as the quarter where the church is located. The statue is a 17th-century wooden sculpture of Christ's mother mourning his death, covered in tears. It is a modern church in the Neo-Baroque style, built between 1936 and 1941 by architect Gómez Millán. The Archeological Museum is said to be one of the best museums of its kind in Spain and it is located in the Maria Luisa Park. There is so much to see in this museum, including artifacts dating back to the Stone Age, Bronze Age and Iron Age, but be sure not to miss the Carambolo Treasure which is located in the section of the Phoenician colonisation. Isla Mágica is an exciting and modern amusement park with seven different themed areas representing different episodes in 16th-century Spanish history. 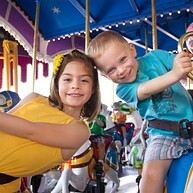 This is a place where the whole family can enjoy themselves, ride the roller coaster, play miniature golf, try one of the four different water rides or explore the pirate ship. Do you need to relax between all the sightseeing? Then head over to Aire de Sevilla and enjoy the Hammam experience in some of the nicest Baños Arabes (Arab baths) in all of Spain. You can unwind with temperature baths or have a massage in a magical atmosphere. 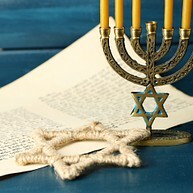 This museum is dedicated to the memory of the Jewish people from the Middle Ages until now. The exhibition is small but very interesting and you can take walking tours of the area to get a real insight of its history.